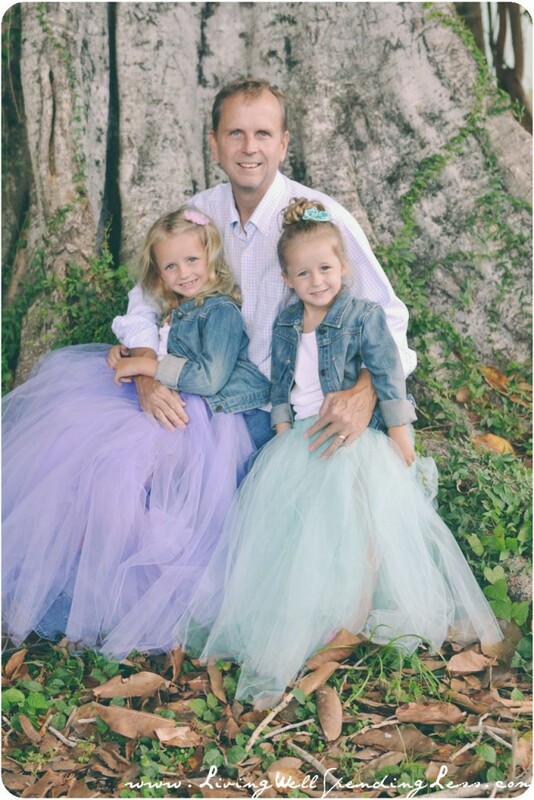 I am certainly not a professional photographer, but I do really enjoy taking photos, especially of my friends and family–I call it “mom-tography.” Last fall some close friends asked me to do a family session for their Christmas card photo. 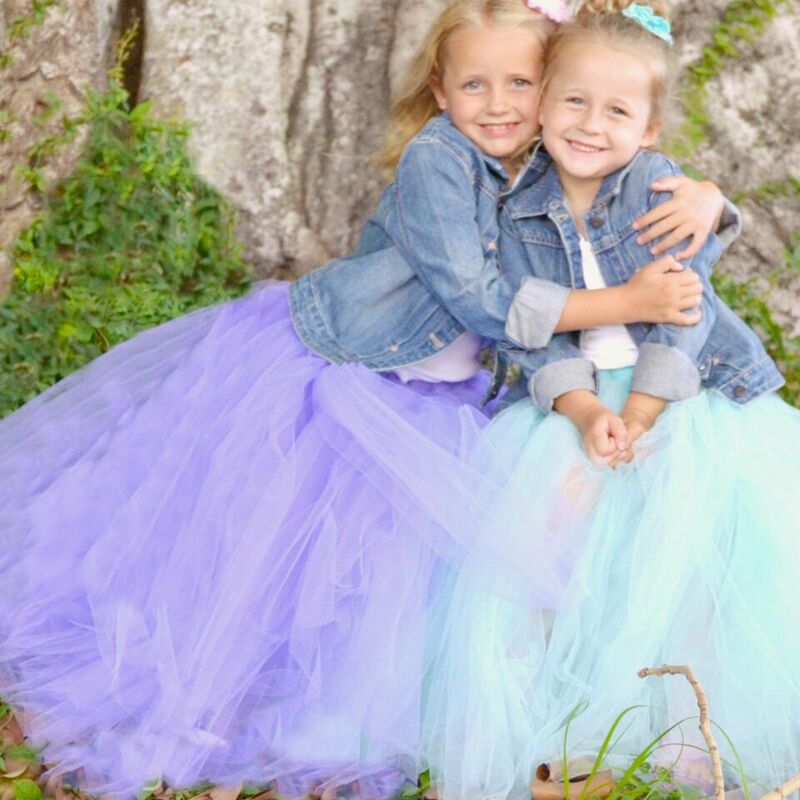 They wanted a look that was fun and playful, with a bright pop of color, so we decided to make a big puffy tulle skirt for their little girl to wear. Had I known how easy it would be to whip these little puppies up, I would have tried it a long time ago. 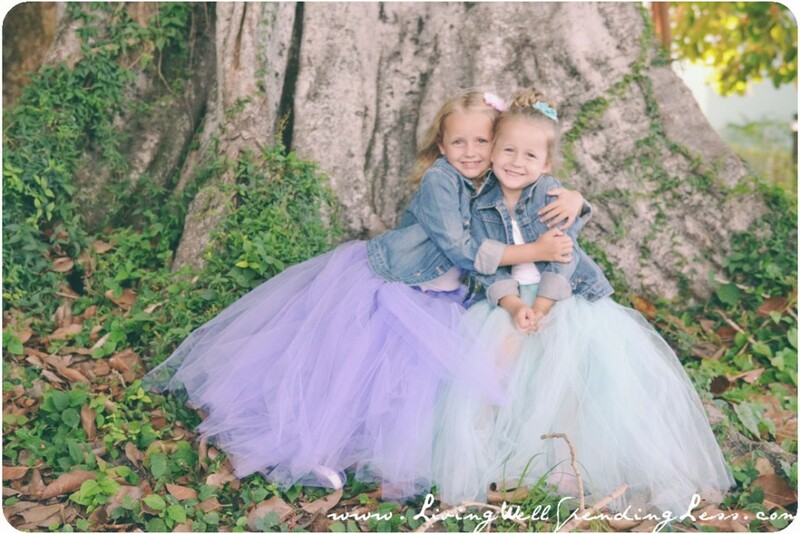 Their family photos turned out absolutely darling, and I made a mental note to make some full-skirted tutus for my own girls the next time we got around to doing a photo session of our own. Fast forward almost ten months and here we are. Step 1: Grab a length of tulle and fold it over, then measure it against your model to see how long the pieces will be that you have to cut. This is not an exact science, but better slightly too long than too short! 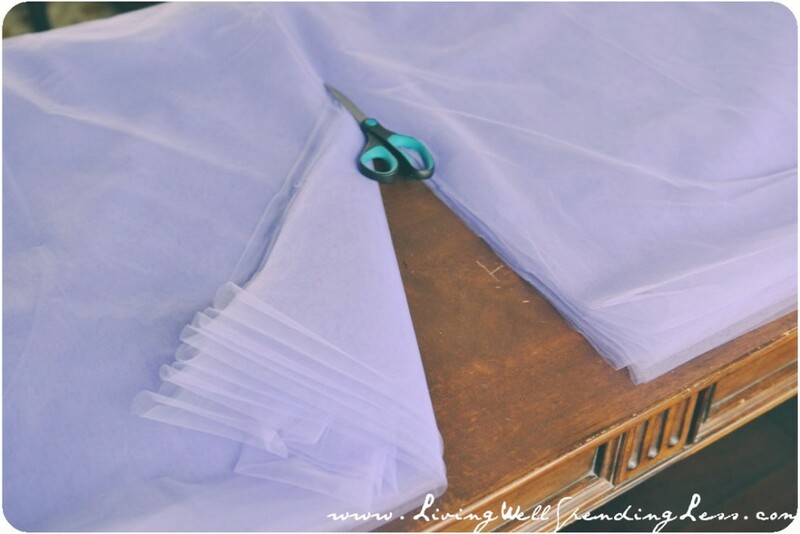 Step 2: Cut your first piece based on your measurement, then cut remaining pieces until tulle is all cut. Step 3: Lay pieces flat on top of each other, then cut in half, starting in the middle of the folded edge. Step 4: Measure a piece of elastic around your model’s waist and tie in place. Don’t knot it too tightly, as you may have to adjust it after the skirt is finished. 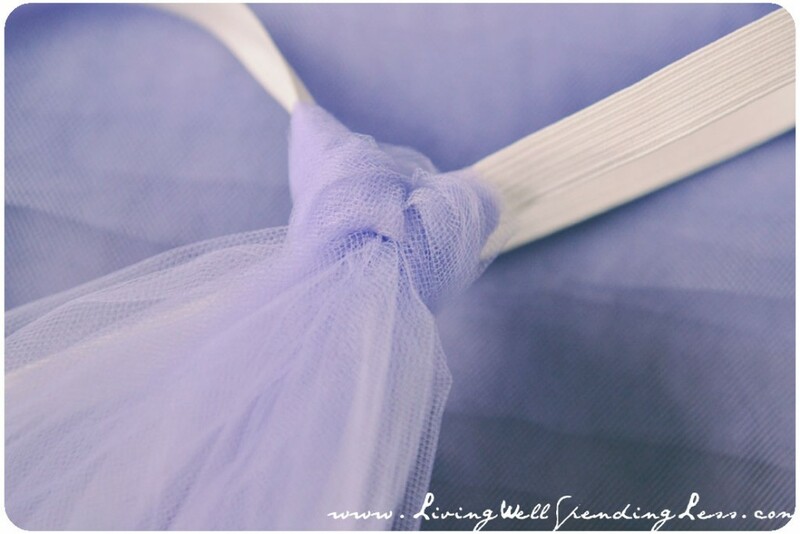 Step 5: Take a piece of tulle and loop it around the elastic, pulling the two ends through the loop as shown. Step 6: Pull to tighten loop, but do not tighten all the way until all the tulle is on the elastic so that you can adjust as necessary. Step 7: Continue looping the tulle pieces onto the elastic until they are gone. 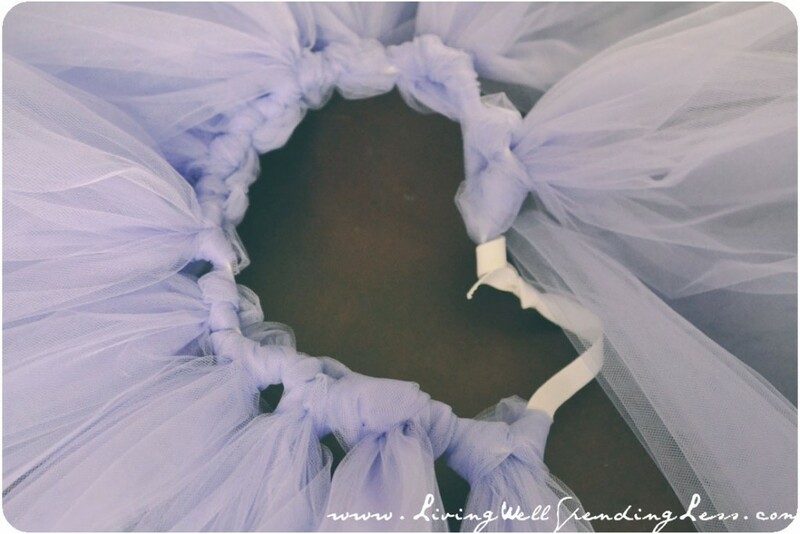 Make sure tulle is evenly spaced on elastic. Step 8: Place skirt on model. Trim bottom of skirt to make it floor length. Adjust elastic as necessary. Tighten tulle loops and you’re done! 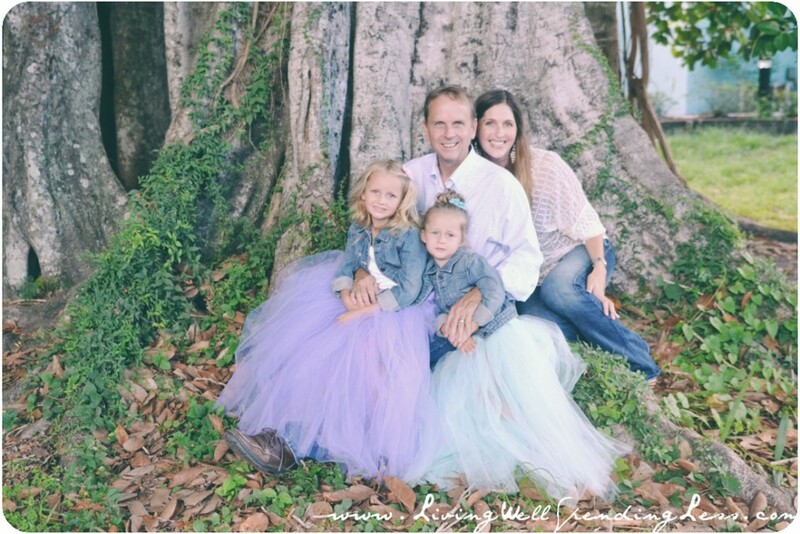 Whether you want to take your own photos or arrange a professional shoot, these skirts photograph beautifully! UPDATE: These photos were shot with my Nikon D3100 DSLR camera fitted with this Nikon Nikkor 24-70 wide angle zoom lens. For the shot of all four of us, I used a tripod and the timer setting on the camera. They were edited using Photoshop and PicMonkey.com. Check out my simple tips for taking better photos here. 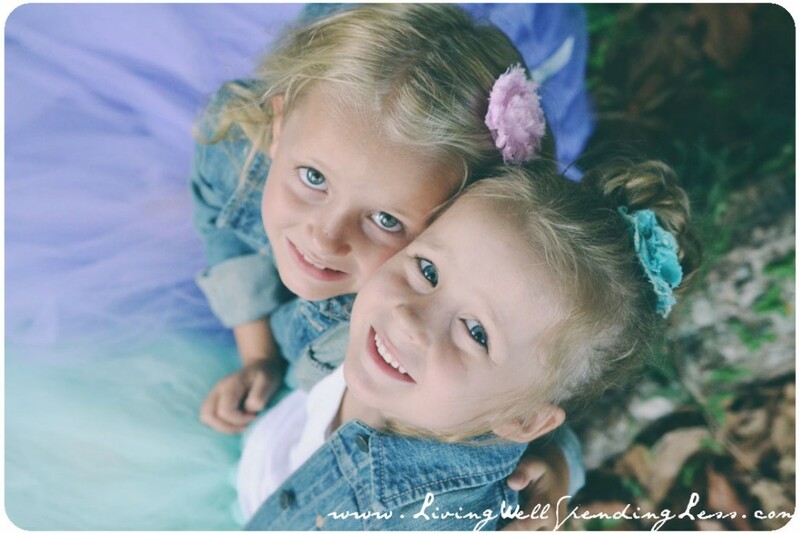 Do you consider yourself a “mom-tographer,” or do you prefer leaving it to the professionals? OMG, your girls are SOOOOO cute! The skirts are adorable! I am totally doing this! What beautiful photos of your family. Did someone take them for you or did you do these yourself? Love the skirts. I can’t believe how easy those look. Thanks so much for the tutorial! Very cute. What do you use to edit your photos? thanks for sharing! this is adorable! can’t wait to make one for my little girl! You’re welcome Rachel! Let me know how it turns out! so adorable. I really want to make one for my toddler now, and try my hand at my own mom-tography. Do you have a fancy camera? My camera is a pretty basic DSLR (the Nikon D3100) but I do have a pretty nice lens. I added the details to the post above! Do they have a slip on under the skirt? Yours are soooo cute! Thank you so much for posting this. I am trying to make myself a full-length skirt for Halloween. I bought 25 yds of black tulle. Before I cut anything, I want to understand your instructions completely. If I am measuring the length from my waist to the floor, then folding it over, why am I cutting it in half? Wouldn’t that make it short? This is the time I wish my mother were still living – she was such a great seamstress and could figure measurements in her head! I’m not that good with math. LOL I just want to make sure I don’t mess it up. Thank you for your help! I appreciate it. If you cut the double length piece in half when you attach the tulle to the elastic, does that not make it shorter?? Do you fold the cut piece in half to make the loop?? You are thinking about cutting it the wrong way. You want to cut *down* your folded length so that you have two pieces that are both twice the length you want but are only half as wide as the bolt. Almost all bolts have the fabric folded over. The instructions don’t *say* to unfold it, but that’s what you do. Unfold and then double over one end to twice your length. Cut. Continue that process. Stack them high and cut them in half starting mid-way through your folds and cutting towards the cut ends. BrendaH: Best instructions for the folding and cutting. Thank you. Awesome tutorial! I was trying to find a way to make a full tulle skirt for my Marie Antoinette Halloween costume and I think this, in adult size, will work well. She is cutting in half LENGTHWISE to end up with twice as many “strips” of 96 inch, (or whatever your measurement) tulle. Each strip is attached to the elastic using the fold and slide through the loop method. 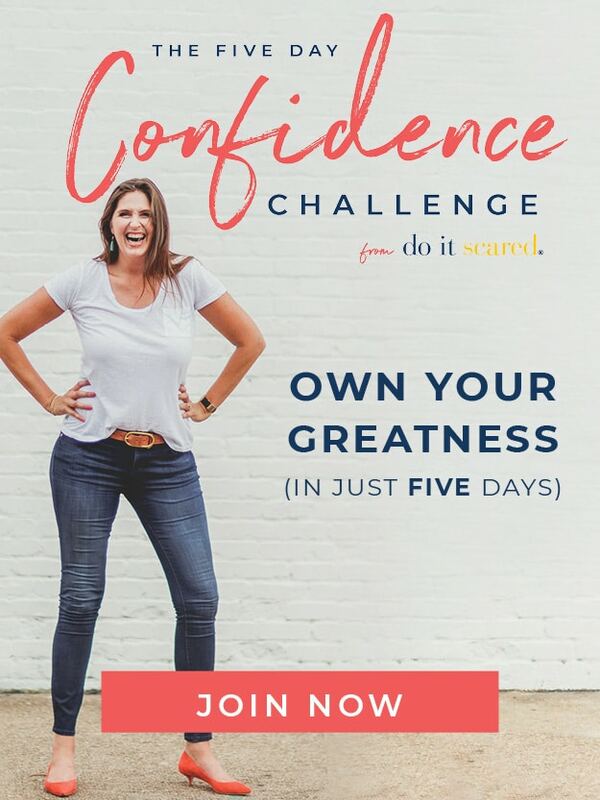 You want the strips double the height from the floor to your waist, but you don’t need them 45″ wide, only about 22 inches … does that make sense? So each strip of tulle is 20″ wide? instead of the typical 5″ wide strips for other tutu’s? So glad to see others couldn’t understand the instructions and someone clarified. I’m now ready to get started! Yeah, the instructions didn’t make sense at all. I love your idea for the skirts! How hard would it be to figure out the measurements for an adult skirt. I want to make one for myself for Halloween! I think it would more or less be the same thing–just double the length from your waist to the floor. 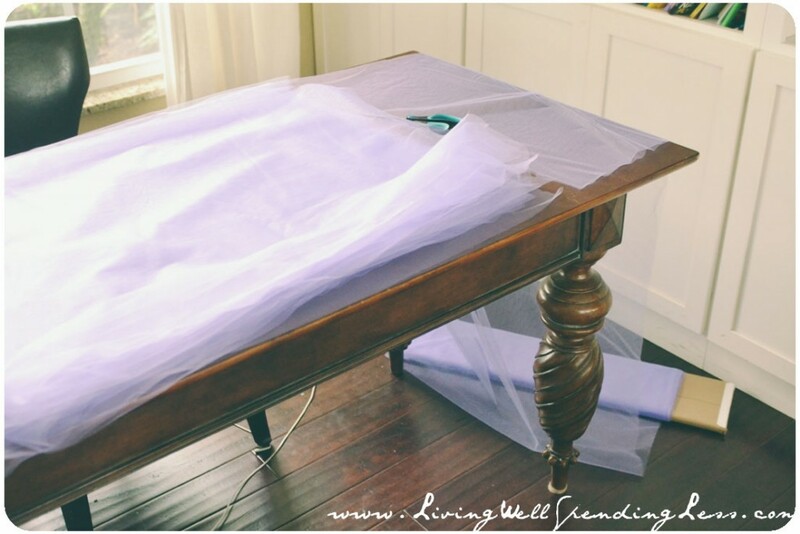 How wide did you make each strip of tulle? Cuz i know for alot of tutorials I’ve seen they are like 5″ wide. But i like how these ones turned out and looks like an actual skirt. Do you know about how many strips of tulle were used per girl? These girls look about the same size as my niece who I am making this for. I didn’t count the number of pieces, but I think I used about 15-20 yards per skirt. Hi! My daughter is fourteen but she absolutely loves these. I was wondering about how much tulle would be needed to make one of these for her? She is about 5’4 if that helps. Thank you so much for sharing this technique! So cute, I’m making a really. Short one and a long one for Halloween. I’m going to make a costume for my neice 🙂 Just want to be sure of the measurments. If i need a skirt to be 20 inches long, and I buy tulle that is 45 inches wide, my strips should be 40 inches long, and 22.5 inches wide when i attach them to the elastic right? Thanks so much! I was just wondering if the 20 yards was for one skirt or two skirts since two are pictured? Like others here although i get that you measure from the girls waist to the length you want and double so when you loop it over the elastic, “voila” it is the correct length, but how wide are each of the strips? Might try to make one for my daughter for Xmas using 3 colours and interspersing thinner and thicker strips eg one main colour and 2 highlights. Do you think this will work? Also, how was the elastic secured in the end? Did you sew the ends together or is it justed knotted on each time they wear it and if so how do you stop the strips sliding off when its undone? Sorry for all the questions but not much money means it must be done correctly first time!! Hey! I was doing some trial and error with this last night. For a girl’s size, I found that 6″ strips gave me lots of fullness. I also cut thinner and thicker strips in my “highlight” color to keep it interesting. The good news is that small imperfections don’t ruin the skirts. They come out cute & wearable even if you are a DIY novice. Thanks for posting this! I was able to quickly create my daughter’s skirt for her Halloween costume! I made two last night for a last-minute costume for myself & 6 year old. Since we were going for a “witch-y” look, I cut some of the strips at odd lengths and angles once the skirt was all done. I also made them black with lime green and hot blue strips. Other than that, I followed the instructions to a tee, and I am so happy with the results! It took me about 3 hours to finish both (I’m not as crafty as Ruth!). They are perfect. I don’t think I will ever buy another $30-40 costume that is mostly tulle again. It’s so easy to make them. Just a note that for an adult skirt, I needed about 25 yards (15 yards of black, and 10 of the lime green accent color) to get the same fullness I got with about 18 yards for the child size version! 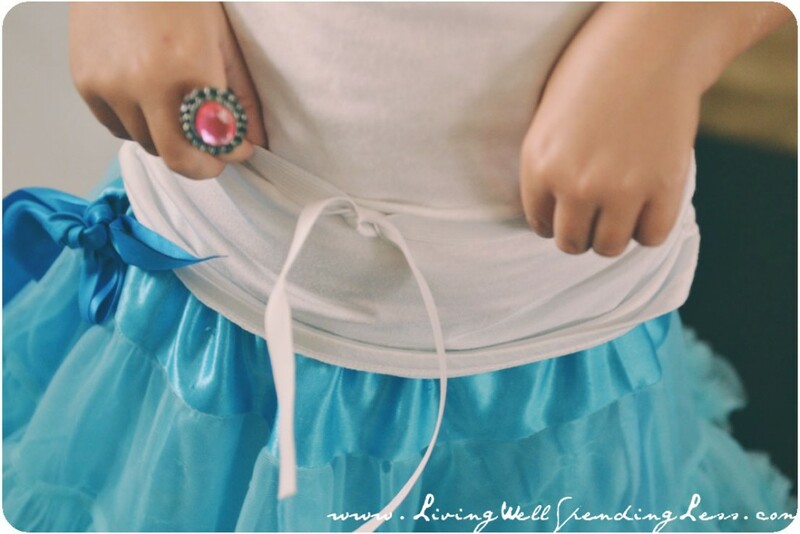 Thank you so much for this super-easy, super-pretty skirt! Would this work with 6″ tulle doubled over and cut to length or does it have to be wider? how many yards would u need for a 5’8 girl. my daughter is 15 but she loves these skirts to death!!! OMG! Wow… I had no idea that this was soooooo easy. I have been wanting to make one for my girls for soooooo long. 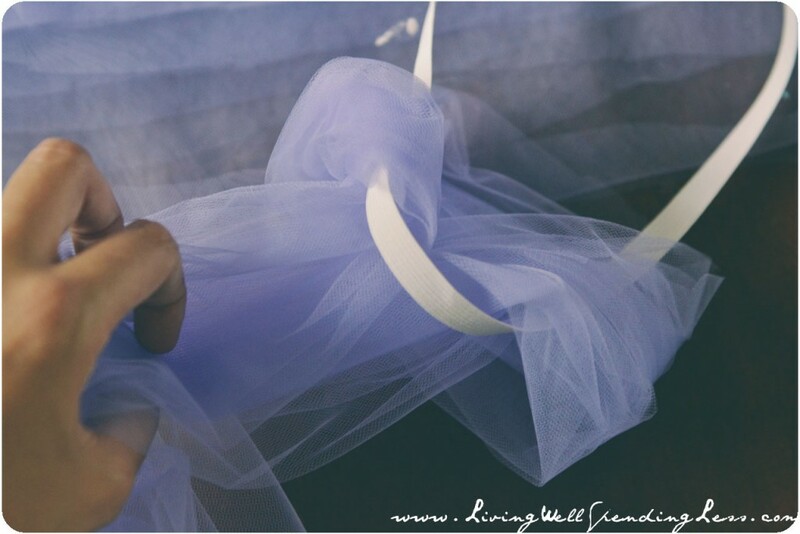 I love sewing and sew every day… However… when i even touch the tulle I get upset at it. I will make one this weekend! And do the photoshoot to boot! Hi, I have just found you through a Pinterest board. 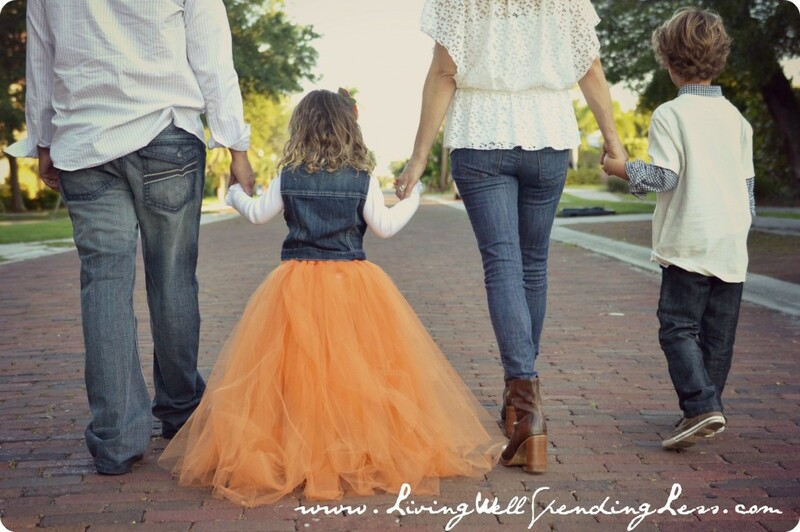 I just absolutely love love love your skirt and the pics of your beautiful family. I have pinned this for use one day Thank you for the tips. I have a Glinda the Good Witch costume I made (for myself) years ago, and every time I go to wear it I groan at the bulkiness of the tulle – I now am armed with a GREAT idea on how to make a perfect Glinda skirt! THANK YOU!! I did one of those hit the forehead “why didn’t I think of that?” things. What were the deminsions for your tulle? 20 yards by __ inches? Sorry to ask, but I am using 6 inch tulle by 100 yards, and need to know if that is enough for a full lenth tutu. So, what would you say about how much AREA you used for each skirt? I’m using 6″ by 100 yards for my tulle, and need to now how much to purchase. Thank you for your reply above! soon.Please check out my web site as well and tell me youur opinion. Hi Ruth! I just want to thank you for an awesome tutu-orial. I found it to be quite easy after taking the time to read and fully understand your directions. My daughter is a princess, so of course she needed this dress! With the help of some imaginery singing birds and mice, it is done. Hi! I was wondering how many strips you used per knot? Last year I made a skirt for halloween (very close to this) but I only used one strip per knot and it was very sheer and not full and fluffy like I wanted it to be. Also, how thick was each strip? I am 5’7 and already know that Im going to need about 25 yards of tulle. Thanks for a reply! is it normal for the elastic to twist and turn? Instructions for folding and cutting are VERY confusing. Please clarify. Hi, I’m making a tutu for a steam punk of Queen of Hearts, It’s way to puffy and I need to tone the puffiness down a little to make the costume look right. What can I do about this. It’s a high low skirt. Beautiful! 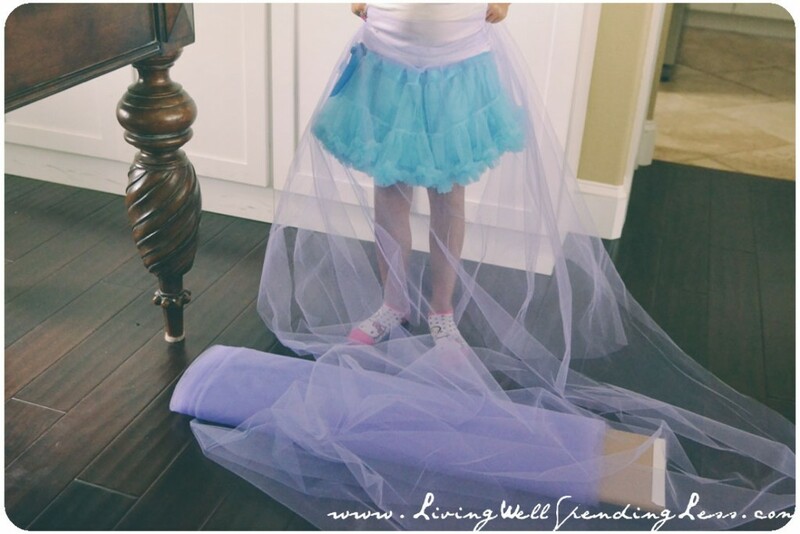 I have never seen long DIY tutus like this before! this is an awesome tutorial! I am making a super poofy one for my princess peach costume! going to cut super long wide pieces for the underneath and have them get shorter and thinner as the layers get higher and higher! Was there any tulle left over when you were finished? I want to make sure I get enough. Thanks! 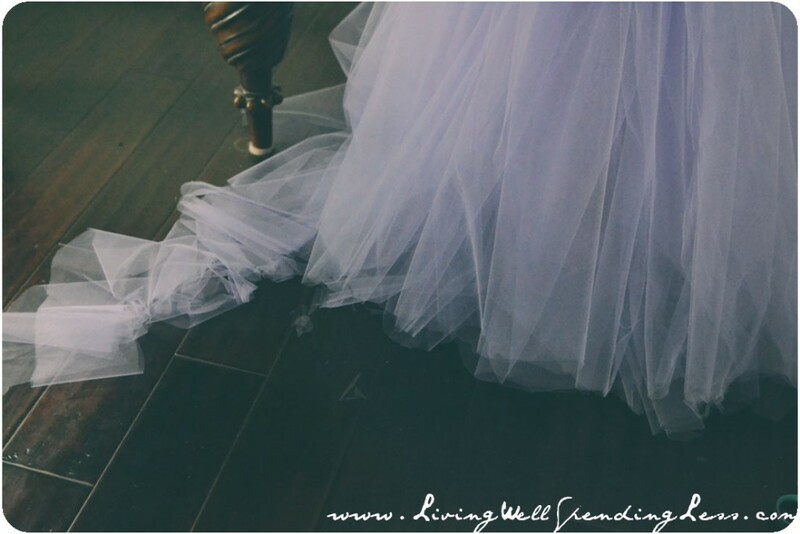 How wide does the tulle have to be? Those skirts are absolutely adorable. Add I LOVE the colors! Where did you buy the tulle? I bought my tulle at Jo-Ann Fabrics but I’m sure you can find it at any craft supply store that carries fabric. You can also find it online. I’m just wondering where you got that beautiful tull? Are your strips of tulle for the no sew skirts 6 inches wide? 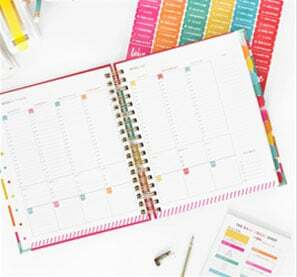 I just love the great tips and ideas! Keep up the great work. wow, thanks! can you use this as a petticoat?